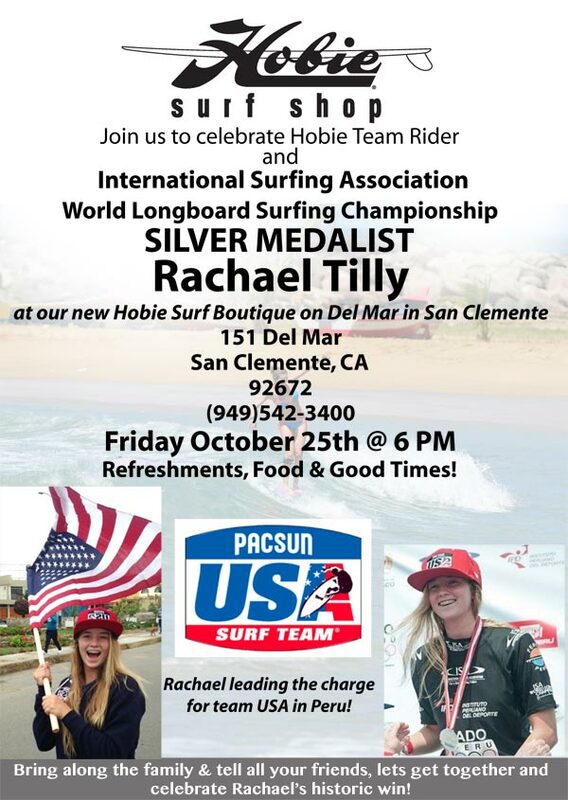 Hobie Surf :: Help Celebrate Rachael Tilly’s Silver Medal Win with Hobie this Friday! Surfing America, the National Governing Body for the sport of surfing in the USA, and Hobie Surf Shops are pleased to announce a reception honoring PacSun USA Longboard Team member and ISA World Longboard Championships Silver Medalist, Rachael Tilly. The reception will be held at 6:00 PM on Friday, October 25, 2013, at the new Hobie Surf Boutique located at 151 Avenida Del Mar in San Clemente, CA 92672. Everyone is invited for refreshments, food and good times in honor of Rachael. Rachael competed for Team USA in the International Surfing Association World Longboard Surfing Championships in Huanchaco, Peru, September 21st through 28th. The team consisted of returning ISA World Team members Tony Silvagni and Taylor Jensen along with Nick Anderberg and Rachael Tilly. The team all took ill in Peru and finished a disappointing 7th overall. Rachael battled back from illness and was the “silver” lining for team USA, winning the Silver Medal for her 2nd place finish in the women’s division. At 15 years old, she was also the youngest competitor in the event. Coach and former World Champion, Ian Cairns, was impressed with Rachael’s performance. “Rachael really dug deep to overcome her illness and grind through her repechage rounds to the grand final. She was feeling better as the event progressed and peaked in the final with an amazing performance. She did not flinch surfing on the world stage against seasoned competitors many years her senior. This result is just the start for young Rachael and we expect to see her reach her goals of winning a Gold Medal in ISA World Longboard Championships and becoming Association of Surfing Professionals World Longboard Champion in the near future,” said Cairns. Rachael Tilly – 15 years old, Capistrano Beach CA. This entry was posted in Hobie Shop, Hobie Surf and tagged blog, california, hobie, Hobie Shop, Hobie Surf Shop, Hobie Surfboards, Isa world longboard championships, longboard, Party, rachael tilly, San Clemente, silver medal, surf shop, surf shop blog, Surfing, surfing america, surfshops, Terry Martin, waves. Bookmark the permalink. ← Hobie Shop :: What We Are Reading and Thinking About This Week 10/21 edition.